Welcome to our 2017 summer newsletter, an overview of our June meeting in which the Board Members and Directors discussed and mutually agreed upon the path forward we will take in 2017. We are delighted to be carrying on with some of our more recently established relationships, as well as looking into our past to reengage with valued organizations with whom the CSF has long, and fruitful history. We are also delighted to be granting a first time charitable donation to an organization new to the CSF. In this newsletter, we highlight the missions, goals, and targeted areas of our donations to these organizations. During our meeting, we welcomed Jen Ashcroft, an Associate Director for Sick Kids Foundation, which will soon be kicking off one of the largest pediatric fundraising campaigns in North America. The Hospital for Sick Children first opened its doors in 1951, and today is Canada’s largest centre dedicated to improving children’s health, staffed with professionals from all disciplines of health care and research. According to Jen, there are a total of 18 operating rooms that conduct more than 12,000 surgeries per year. Last year, SickKids admitted over 16,000 patients, and with this number increasing each year, on rare occasions it is forced to turn families away. In order to construct a new, state-of- the-art building on University Avenue, the upcoming SickKids Vs. Limits campaign will endeavour to raise 1.3 billion dollars, helping the hospital to provide health care to every child in the future. The CSF has a long history of support towards SickKids, in various areas, most specifically Rheumatology. This honoured the legacy of the late Dr. Hugh Smythe, youngest son of Conn Smythe. Considered a pioneer in the field of rheumatology, Dr. Smythe was an accomplished man who among other things, dedicated his life to the study and treatment of rheumatism. We are extremely pleased to carry on our tradition of giving to the Hospital for Sick Children. Our pledge will be directed to the suspected child abuse and neglect program (SCAN) and Patient Amenities. The SCAN program helps hundreds of SickKids children who have endured abuse. As the Patient Amenities Fund is a resource to help prevent financial needs further compromising a child’s health, those patients referred to SCAN may have further requirements such as travel expenses, alternative child care, and relocation expenses. Thank you to Jen Ashcroft of SickKids Foundation, for enlightening us on the extraordinary goals they aim to achieve. If you wish to learn more about the scope of the fundraising campaign, please visit fundthefight.ca. The CSF met with Victoria Scullion, a representative on behalf of the Wellspring Cancer Support Network. Wellspring first opened its doors in Toronto in 1992 as the Coach House, and today has grown to eight centres across Canada. Their mission is to create the best programs to meet the psychological, emotional, and educational needs of individuals and families living with cancer, and to deliver those programs to people in Canada. Their services are free, with no referral needed, and they received over 40,000 visitors last year. A large percentage of cancer patients can also experience anxiety, pain, financial worries, feelings of isolation and guilt, and other non-medical consequences in addition to receiving treatment for the disease. Victoria shared that 1/3 of all cancer patients are in their “working” age, which can create financial stress to the family. Wellspring offers over 40 different programs designed to help each person’s specific needs to manage stress, restore their health, and take an active role in improving their quality of life. The CSF has pledged to support the Wellspring Cancer Support Network, with our donation directed to their Cancer Exercise program, which is for Wellspring members at any stage of their treatment. Thank you to Victoria for visiting us and answering our questions during the meeting. The Holland Bloorview Kids Rehabilitation Hospital has an over 100 year history in Toronto, and has evolved through major changes over those years with many locations and name changes. Over 7,000 children come through their doors each year, making it Canada’s largest children’s rehabilitation hospital focused on improving the lives of kids with disabilities. Their mission is to provide specialized programs and clinical care for children and youth with complex care needs to enable them to participate in life to the fullest. 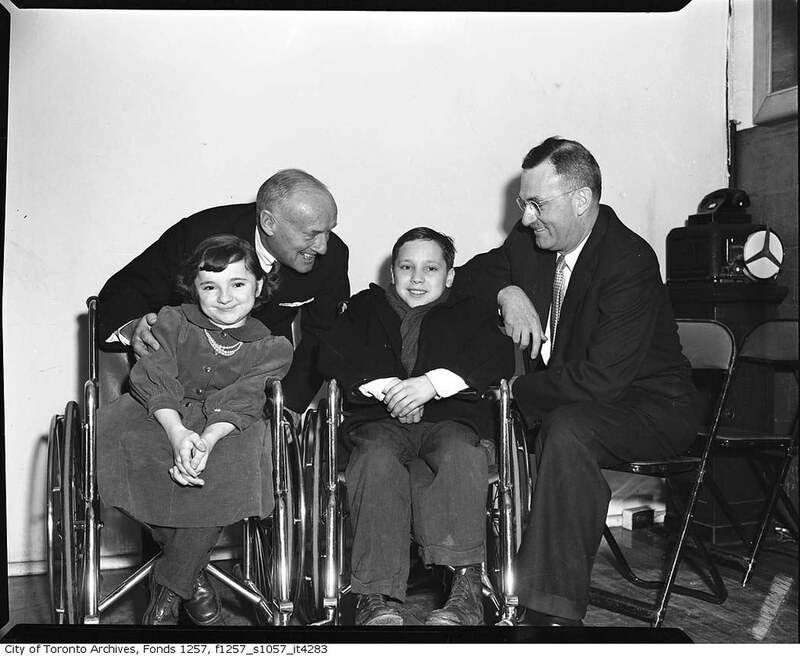 Conn Smythe was heavily involved with the hospital, then known as the Ontario Crippled Children’s Centre, and his philanthropic involvement carried over to his grandson, Tom Smythe, a long-time loyal donor to Holland Bloorview. The CSF is proud to renew this longstanding historical bond with Holland Bloorview in 2017. Our donation will be towards their Weekend Respite day program. Respite care is a family support service providing temporary relief from the physical and emotional demands involved in caring for a child’s disability. Eva’s Initiatives for homeless youth first opened in 1994, after community outreach worker, Eva Smith, noticed a rising trend of homeless youth in her home community of North York. Fast forward to today, Eva’s Initiatives has three separate facilities providing shelter, food, 24/7 crisis support, and essentials for living for 123 homeless youth aged 16-24 every night. Their mission is to work collaboratively with homeless and at risk youth to reach their potential to lead productive, self-sufficient and healthy lives. Their primary goals are to prevent, reduce and end youth homelessness. Eva’s Initiatives as an organization that the CSF has supported in the past, and we are extremely happy to renew our support for them. Finally, after review and discussion amongst Foundation Members, we have unanimously agreed to carry forward into 2017 continued support of Casey House, and Kids Up Front. Both have been highlighted in our 2016 newsletters. Please look for our year end newsletter in December for our updates on news, progress, and successes achieved by Casey House, and Kids Up Front on their initiatives supported by the Conn Smythe Foundation. Thank you for reading our summer 2017 newsletter. Please do not hesitate to contact us via our webpage should you wish to submit a request for funding and you believe the Conn Smythe Foundation is the right charitable body for your organization or idea. On behalf of all of us at the Conn Smythe Foundation, we wish you a safe, healthy, and productive summer. With 2016 coming to an end, the Members and Directors of the Foundation have held our annual Fall/Winter meeting, allowing us the opportunity to finalize and review the charitable organizations we have chosen to support this past year. Over the past five years, we have committed to a change in our donating strategy in terms of the numbers of charities we support and the donation amounts given to each organization. In the years prior to 2012, the CSF would routinely disperse small set amounts to dozens of organizations each year. Since this change was implemented, we have made larger donations to a smaller, more focused group of charities, so that our contributions can be more meaningful and have more of an impact. Furthermore, we have been placing a higher importance on continuity of support to our chosen charitable organizations. By committing for two, three or more years, we strive to form relationships with each charity to better understand their specific needs and assist in their budgeting efforts towards new initiatives and programs. With this philosophical goal in mind, we are proud to pledge our continued support to our small, diverse group of unique charitable organizations in 2016, some of which we have previously highlighted in our summer newletter: Emily’s House, Casey House, Regent Park School of Music, Jessie’s Centre, Kids Up Front, Children’s Book Bank, Child Development Institute (Camp Towhee Program). Now welcoming up to 300 children and youth annually, Emily’s House is Toronto’s first children’s hospice, with ten palliative care beds. Having supported Emily’s House since its inception in 2013, the CSF has contributed to growth in all areas of their operations, including their Recreational and Play Therapy programs. These are a broad range of activities including arts and crafts, music lessons, and even a week long summer camp. Together, these help to reduce anxiety and alleviate pain and suffering experienced during a prolonged illness, while allowing the children to participate, play, and just be kids. “When there is no cure, there is support, compassion, and care… there is Emily’s House” – Rauni Salminen, CEO Emily’s House and Philip Aziz Centre for Hospice Care. Founded in 1999, Regent Park School of Music started with 71 students in a church basement. It now reaches up to 1300 children and youth per year, providing music history and theory classes and lessons for multiple instruments. Proudly providing support since 2014, this year the CSF helped 30 kids have a music education at the school. “Helping kids succeed through music”, Regent Park School of Music continues to grow and evolve, with several new and highly anticipated projects culminating in the next months and years. Jessie’s Centre helps over 1100 women and children each year, offering a range of programs and support for pregnant teens and teen mothers. The CSF has been involved in funding directed towards their “A Dressing Success” program. Jessie’s Centre has now launched their second Economic Community Development Program. Entitled “Social Enterprise – All About Kindness”, it is a program designed to train young mothers as doulas. A doula, provides prenatal, birth, and postpartum support to women requiring help. The CSF is proud to help support Jessie’s Centre and anticipates great success with this new initiative. The CSF has lent support to Camp Towhee in three separate projects in three successive years. Located in Haliburton, Camp Towhee is affiliated with the Child Development Institute and accommodates about 100 campers aged 10-17 with learning disabilities and mental health issues. We have received an update regarding the Ropes challenge course. The “Dangle Duo” entails two participants who must climb a ladder at the same time. The rungs become further apart the higher you climb requiring teamwork and problem solving for both to reach the top. The CSF has also donated funding for a new basketball court surface, which will be ready in time for summer 2017. Looking back over our long ambitious history, we celebrate our continuing commitments to our chosen charities of today, while having an eye on our future. The Conn Smythe Foundation looks to embark on new and exciting paths forward. Whether it be small burgeoning charities seeking a chance to flourish, or larger more established ones with new initiatives requiring support from private foundations such as our own, our Members and Directors look to work with individuals or organizations within our communities. There is not a specific mission statement, and there are no set guidelines. Members and Directors are each treated as an equal partner, who can bring their thoughts, opinions, and ideas for our group moving forward and have them received openly by the passionate, caring people within the Foundation. We remain focused on medical, education, sports and arts programs aimed at women and children. Please reach out to us if you believe our Foundation is the right fit for your organization or your own idea. From all of us within the Conn Smythe Foundation, thank you for reading our Winter 2016 Newsletter. May peace and joy surround you throughout this holiday season and into the New Year.